Schools in Sri Lanka have been banned from imposing dress codes on parents visiting the premises. It comes after a poster outside one elite private school, which dictated what women should wear when picking up their children, sparked an outcry. The notice said that saris and loose dresses were allowed - but not skirts, or strappy or sleeveless tops. Several state and private schools in Sri Lanka have been known to turn away parents because of their outfits. Akila Viraj Kariyawasam, Sri Lanka's education minister, told the BBC that many parents, especially mothers, had complained to him about the restrictions. "Schools cannot decide what attire parents should wear," he said. "Mothers especially were facing problems because of these dress codes... Most working mothers don't always wear saris. Some have uniforms, and they are compelled to wear a sari in the morning just to drop their children off at school, and then change to go to work." Mr Kariyawasam said he had sent a circular to all schools, telling principals they could not place restrictions on what parents wore. He said: "Any mother will know how to dress to attend a school, and a dress that is appropriate to the school environment should be fine. "The world has changed now. We should also adapt with that. We should have laws that help the public, not hassle them." 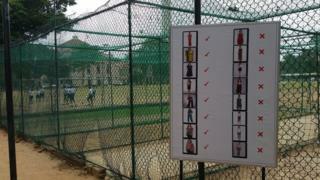 The poster was put up last week by St Joseph's College in the capital, Colombo. It showed 16 pictures of women in a variety of outfits, with tick marks against half and crosses against the rest. Another leading private school, St Peter's College, said it also had a similar notice outside its gates. "This is a boy's school after all and we have a notice so that women know what they should and should not be wearing," an office member said. The poster attracted widespread criticism online, with many feeling the rules were unfair to women. "Do they realise we live in a tropical country? Moreover, where is the board for dads?" one user wrote on Facebook. Others defended the dress codes. One teacher said they were needed because "a lot of parents, particularly young mothers today, wear inappropriate clothing to boy's schools".